Hailed as “the mother of all mountain music festivals” by The Sunday Times and the greatest show on snow, Snowbombing is truly one of a kind and one you won’t want to miss. When heading to Austria for a ski holiday you can expect a warm welcome, top quality service, killer landscapes, world class skiing and a Dutch led party scene that knows no bounds. Mayrhofen has a particular allure for snow fans with its award winning terrain parks, high altitude skiing and massive ski area. Experience 135 km of snow sure slopes with the Mayrhofen ski pass or extend your stomping ground with the Zillertaler Superskipass and make the most of your time in the Austrian Alps. Breathe in the pure mountain air and marvel at the scenery surrounding the nearby grand Hintertux glacier. Try your hand at snow tubing, paragliding, skidooing or take a sleigh ride or winter walk through this sugar iced paradise. Featuring one of the best snow parks in Europe (the Vans Penken Park) and the steepest slope in Austria (the Harakiri), Mayrhofen guarantees great skiing and a lively atmosphere that will see you coming back for years to come. Self-proclaimed as ‘a week long whirlwind’, Snowbombing festival marks a monumental end of season blow out for Austria’s sexiest ski resort every year. Improving with age, Snowbombing has ruled the mountain party scene for well over a decade and the agenda gets bigger and better each time. 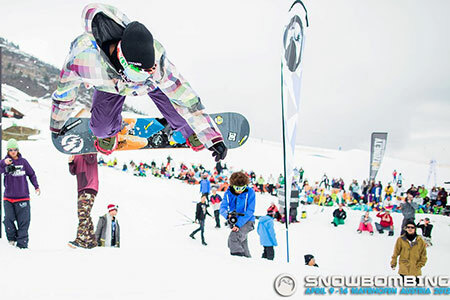 Energy is high and colourful during the day with slick snow sports and a fetish for fancy dress, whilst the musical backdrop echoes through the resort from an eclectic mix of festival stages. Night crawlers are kept worshipping the dancefloor until the early hours thanks to the enslaving evening’s entertainment. With previous headliners including The Prodigy, Pendulum and Kasabian on hand to keep the party going, Snowbombing promises to bring the noise with incredible future line ups and ground breaking artists. Hosted by one of Europe’s finest skiing and snowboarding areas, festival goers can rest assured knowing they are in for a week of quality snow sports and silky slopes. Hunt down the rooftop Jacuzzis and luxury spas for essential recharge and relaxation. Fly form the UK direct to Innsbruck, Salzburg or Munich where you can pick up a transfer or take the train to resort. Budget coach travel is relatively easy to arrange or you could embark on a self-drive adventure with your best friends and see some stunning scenery along the way.